How do you usually make a list of products and goods before going to the store? Do you write the list on paper, or do you remember all the ingredients? 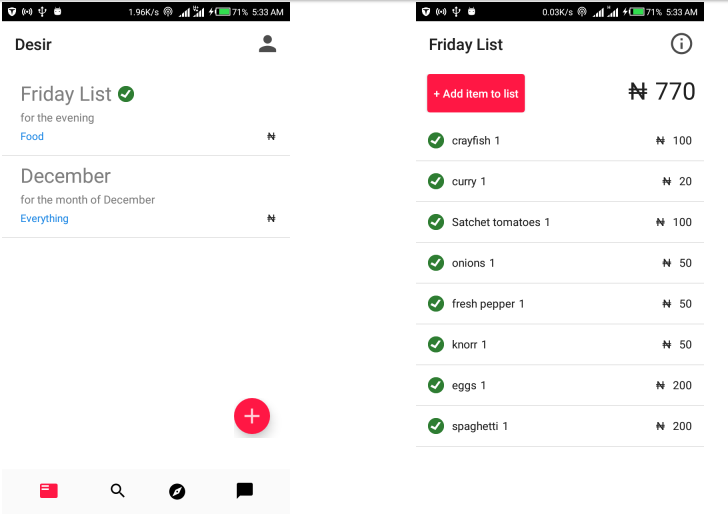 What if you don’t have to make a paper list, all you need is already in your smartphone! You take your phone with you to the store, admit it. What if there is an application, which can do better than a piece of paper? In some cases, when there are many items that you need to buy, a pen also may be needed, because it will be difficult to distinguish items that have been already bought from the rest. Therefore, Desir was created. Desir is an application created to assist in making purchases, prioritizing purchases and reducing unnecessary expenses using a mobile phone. Desir was first released on November 2, 2017, by Desir Softwares, a software developer from Lagos, Nigeria. Desir is available on the Android platform and has over a thousand users. Most people see it as more than just an assistant application, because it helps them keep track of their expenses. Explore items that you see around you and also read about them. Desir also gives the opportunity to post items for people to explore and learn more. This gives people a better shopping experience. Desir comes with a simple design and it is easy to use. We are also incorporating Artificial Intelligence to make shopping even more interactive. Create lists, add items to lists in unlimited quantities as you want, calculate prices with this application. Your listings can be stored in the cloud. This is important for retailers because they like to keep track of their previous expenses. Send lists to your contacts. You can add people to your contact, using their email. Explore the objects you see around you, and read about them. Desir also provides the ability to place items for people to study and learn more. It gives people a better shopping experience. Desir comes with a simple design and is easy to use. Artificial intelligence is also being introduced to make shopping even more interactive. As for software and gadgets, people's personal information is vital for them. That's why Desir was created in such a way that it does not require a lot of user data. During the registration process, it needs only your name, email address, gender and country. When people search for you on Desir, all they can see is your name, surname and profile picture or company logo. Even the items you post can be hidden at any time. Desir is an application that changes your shopping experience.